MADRID -- A bullfighter was fatally gored in Spain in an eastern town - the first professional matador to be killed in the ring in more than three decades. Victor Barrio, 29, was pronounced dead late Saturday by a surgeon at the Teruel bullring. Barrio was first gored in the thigh by the 1,166-pound (530-kilogram) bull's left horn and his body was flipped over. He was gored a second time in the chest and the blow penetrated a lung and his aorta as the matador was on the ground. Medics were at his side almost immediately, but attempts to save his life were unsuccessful. The goring of Barrio was broadcast live on television and news of his death stirred widespread reaction ranging from the bullfighting community to politicians. "My condolences to the family and colleagues of Victor Barrio, the deceased bullfighter this evening in Teruel. Rest in Peace," Spanish Prime Minister Mariano Rajoy tweeted. Prominent bullfighter Enrique Ponce said he was "deeply saddened by the death of my colleague in the ring. Let God embrace him in all his glory. Great matador." Participants at the famed running of the bulls at the San Fermin festivities in Pamplona wore improvised black armbands in honor of the fallen matador while dashing along the streets on the way to the bullring on Sunday morning. Festivities in Teruel were immediately suspended following Barrio's death, and Las Ventas, the Madrid bullring were he debuted back in 2010, posted a heartfelt remembrance of the young bullfighter. 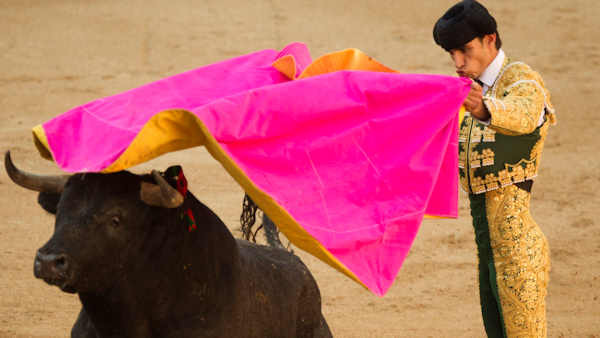 He was the first professional matador to die during a bullfight in Spain since 21-year-old Frenchman Jose Cubero Yiyo was fatally gored in 1985 in Madrid. Before Barrio's death, Manolo Montoliu, then 38, and Ramon Soto Vargas, 39, were also fatally gored in 1992 in Seville while serving as "banderilleros," matador's assistants.